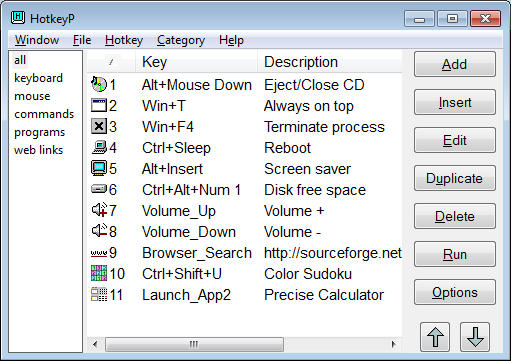 "HotkeyP is a small but powerful macro and hotkey utility that enables you to create a wide range of macro commands and keyboard shortcuts that can perform common tasks such as opening files, running programs, empty the recycle bin, reboot your PC, start the screensaver and much more......"
"HotkeyP does not look like much, but it has a ton of features under the gray hood. Standalone program, no installation. " To avoid a registry entry you have to unclick the option in its settings for autostart. Forgot to check with RegShot, so have to trust snapfiles. When you click the option for remote control (mouse/remote tab) it will create an extra directory. Have to say, in my view, such a little program (148KB) using about 10 MBs in resources is a bit much, but I might get addicted to it, nevertheless. After I let it autostart, it now only uses about 6.5 MB resources. For me this program turns out to be a keeper. I can call up all my favourite folders quickly with hotkeys now. As it uses many system tasks ready for use with hotkeys it's probably even useful on foreign computers. Gotta add: after I let HotkeyP autostart, Windows takes quite a bit longer to start. Above all, my firewall (ZoneAlarm) now takes about a minute longer to load and is now the program that gets loaded last, whereas before it was one of the first to load. Maybe it's just a weird coincidence. Am really hooked on that program already. Oh well, that program IS portable. Just found, accidentally, that it had created a file, (.htk) with the hotkey settings in "My Documents". You can place, of course, that file anywhere (for instance in HotKeyP's own directory) and load it in HotKeyP. So, I got all my former hotkeys back. Seems, through my image restore of the system partition the program lost the path to the file. Now, I just can't tell where it stores the path to that file. I'd say, in the registry, but I can't find anything. I've been using this 1Mb Miniutil for years and to make it portable I had to use Vmware's ThinApp but got a little problem: after a year of using the ThinApp remake of HotkeyP's folder is now 284Mb long. So I hope there is now a better way to make it portable since its far the best ad more versatil hotkeys application and I'v tried really a lot of them. If anyone gets to a solution please post. Greetings. I believe it is... I've never really checked though. dilentec wrote: If anyone gets to a solution please post. Greetings. Here's an NSIS Launcher to try. Just download the zip package and extract into the "HotkeyP" folder next to the launcher. If you already have a script rename it to "HotkeyP_USB.htk"
and place with the programfiles. I didnt mess around with the spy.exe...so use at your own risk. without manually adding a shortcut to the start up folder. JauntePE might work pretty well with this too. Last edited by Napiophelios on Tue Jul 08, 2014 6:15 pm, edited 1 time in total. Reason: Writes settings to registry. Thanks Napiophelios for the Launcher. It worked great. The problem I had was the HotKeyp_USB.htk file being left over at C: when shuting down windows without closing HotKeyP, and then wiped out by DeepFreeze (wich all my computers use). Note: For a fancier solution, you can use Batch to Exe Converter (http://www.portablefreeware.com/index.php?id=1660) on the Bat File and Include both HotkeyP_USB.htk and HotKeyPUSB.exe files. You can set it to erase temporary files, add a custom icon, etc. Comments are welcome, and if I can help anyone implementing this great App more or less portably, feel free to textme through this forum. Of course if Napiophelios adds support for my kind of situation to his launcher, it will be most welcome too. Thaks again. Even though TyperTask is not as easy of use as HotkeyP, it's portability and versatility makes it a true alternative. Thanks freakazoid for the suggestion; I'll tryit out as a natively portable replacement for HotkeyP. You might also like Hoekey, which I mentioned above as well. It's probably more similar to HotkeyP. Last edited by Midas on Fri Jul 13, 2012 4:48 pm, edited 1 time in total.